The Ambassador of Panama in Thailand, S.E. María del Carmen Martínez, has culminated a long process of support and promotion to the participation of the Kingdom of Thailand at the World Youth Day (WYD), an event that will gather in Panama City to young people from all over the world with His Holiness Pope Francis, between January 22 and 27, 2019. The negotiations also included the Kingdom of Cambodia, a country where the diplomatic representative performs work as Ambassador Concurrent. 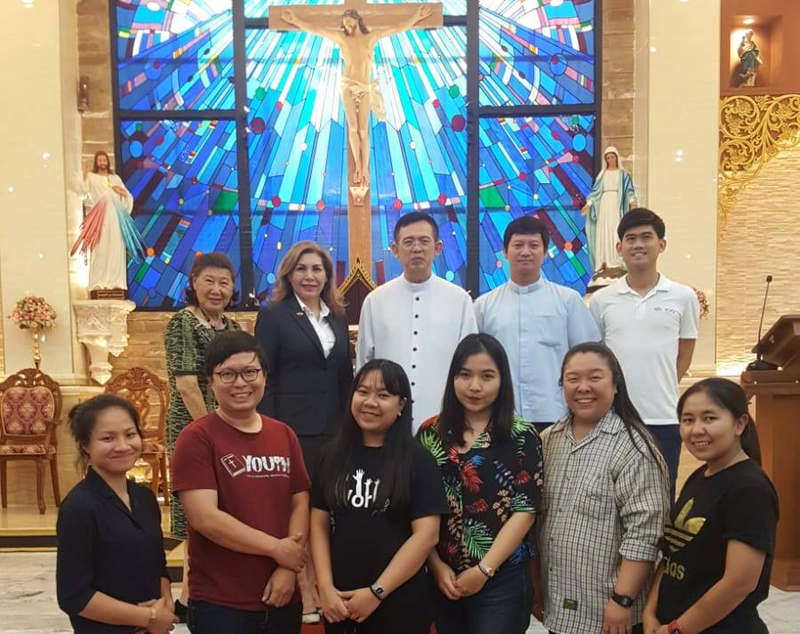 With the realization of an emotional Mass of Thanksgiving that took place in the Church of San Juan Bautista de la Salle, in Bangkok on Monday, January 14 the delegation of 10 young pilgrims and representatives of the Church were departure Thai Catholic who undertake a trip to this important world event. Its Excellency Bishop Siripong Charatsri, of the Episcopal Conference of the Kingdom of Thailand, was the one who had the coordination of the Thai participation. In their words, the Bishop was exalted and exhorted this important presence as an unequaled opportunity for young people from different parts of the world to meet world to be able to further explore the country through Faith and spirituality of our nations. Among the support efforts carried out include interviews with the Nuncio Apostolic of His Holiness in Thailand and Cambodia, Archbishop Paul Schang In-Nam; with the Cardinal Archbishop of Thailand Kriengsak Kowitwanit and with others authorities and interest groups, as well as their participation in the ceremonies ecumenical celebrations on the occasion of the fifth anniversary of the pontificate of HH the Pope Francisco. In addition, contacts were developed with various congregations with aims to stimulate an effective presence of young Thai Christians, such as those who now travel to Panama.